The Chaste Tree, also known by its common names Lilac Chaste Tree, Hemp Tree, Sage Tree, or Indian Spice, is a native of China and India, although long ago it became naturalized throughout the South. The early American nurseryman Peter Henderson stated that Vitex has been cultivated here since 1670. For folks in the warmer part of the South, the "Lilac Chaste Tree" has been the shrub of choice to mimic lilacs, which are restricted to cooler regions. 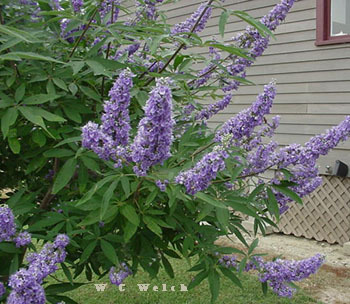 Vitex is an excellent choice for a large shrub or small flowering tree in the smaller, modern suburban landscape. It does best in full sun and will grow in a variety of soils, provided they are well drained. After it has been established, the Vitex is a good candidate for planting in a xeric garden, where hot, dry surroundings prevail. Like many members of the Vervain family, Vitex attracts butterflies and other insects. The older strains had small spikes of flowers in pale lilac, mauve, off-white or light pink, but modern, much improved varieties such as 'Montrose Purple', 'LeCompte', or the pink 'Salinas Pink' have spikes as long as 8 to 12 inches in length. Many aromatic black or brown seeds may be set, but if the spent spikes are cut off promptly after the first flowering the shrub will bloom again. The common name 'Monk's Pepper' refers to the medieval belief that utilizing potions made from the berries helped monks maintain their vows of chastity. Vitex is still an ingredient in herbal remedies for a variety of conditions. The blossoms of Vitex emerge from May to September, and the aromatic leaves are palmate, with five to seven leaflets. All dead wood and lower limbs may be removed from the shrubs in wintertime. Propagation is from cuttings in summer or winter. Lower limbs may be layered by burying in the ground, and there are sometimes volunteer seedlings that may be transplanted elsewhere in the garden. Vitex is hardy in zones 6-9.